What is Fabulous Felines NWA? ﻿We are not a shelter. Instead, we operate through a network of volunteers and foster homes. We are almost always full so if you are looking for a cat or kitten, please contact us through fabulousfelinesnwa@gmail.com to find out next event, or how to visit in our foster homes. I'm sure we will have the kitty that will make you fall in love! Also contact that email if you would like to become a fosterer. We always need them! ﻿As a nonprofit rescue, we have bi-monthly adoption events in Rogers Petsmart in the Promenade Mall. We have 5 cages full of kitties looking for their forever homes. We sometimes do events at Petco in Rogers too, or show kitties at the Fayettville Petsmart. Our fosterers range from Fayetteville to Joplin! 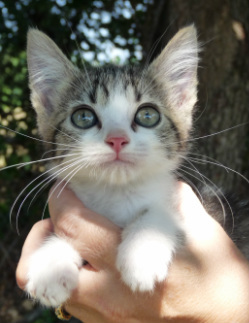 Have a cat or kittens you need help finding homes? We can "Courtesy Post" your them for free on our Instagram, Petfinder, Adopt-A-Pet, Rescue Me, and Facebook . We can also advise you on low-cost spay and neuter resources in the Northwest Arkansas area. Ask for our paper on how we Courtesy Post and what we need from you. We ask the adopter of a Courtesy post to please donate to Fabulous Felines the adoption fee in line with our other adoption fees. At Fabulous Felines NWA, our cats are fostered indoors only, in loving homes with experienced cat caregivers. We know their personalities, likes, and dislikes, so we can match you to the right cat for your family. ​We do not allow our kitties to be declawed for many reasons. But we do rescue declawed cats if that is what you must have. We also ask that our kitties be kept as inside only kitties for their health and well being, and they make more loving companions to you. Because we are a private cat rescue, we receive no tax dollars. We are funded solely by donations. All funds we receive go right back toward allowing us to continue our mission of helping cats in northwest Arkansas. We are always looking for more dedicated volunteers and foster homes. Please contact us if you wish to join our group!